Check out the incredible story of the epic Parasite dragster below, which can be found on John Melniczuk Jr.’s J&M Enterprises site. This tale of the twin-engine Triumph marvel built by John Melniczuk Sr. and later restored by John Jr. is truly something to behold. The images alone are enough to make you crazy. Combined with the personal stories behind the bike and the family’s who shared in its history make it a truly special piece of history. 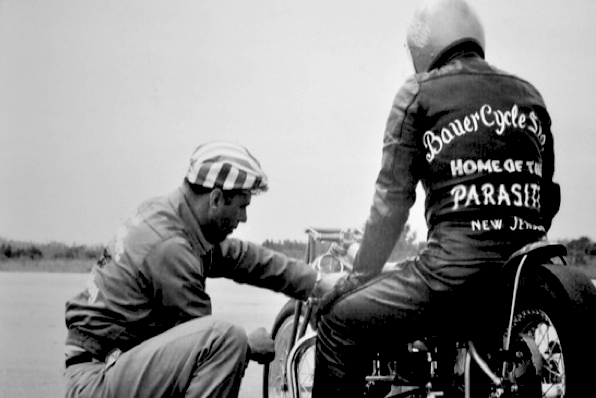 It all started in the winter of 1958 when John Melniczuk Sr., a Triumph Dealer and owner of Bauer Cycles of Salem, NJ, and Tommy Grazias, a fellow racer, first toyed with the idea of building a twin-engine dragster. Both had been racing T-I10 Triumphs and the thought of taking the engines from each and building one dragster was too tempting not to try. John would design and build it and Tommy would race it. 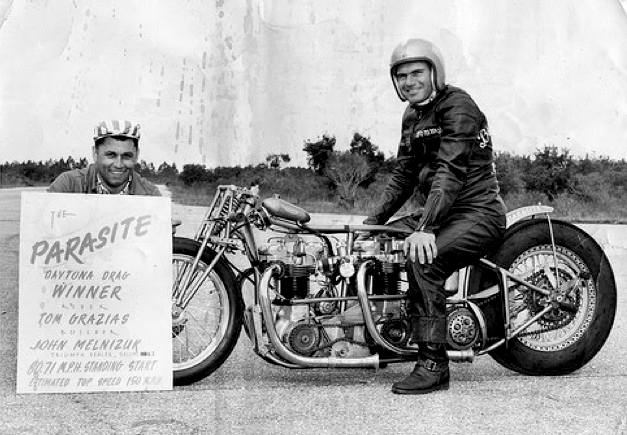 The best place to showcase such a motorcycle was the upcoming Daytona Drags. The bike would have to be ready to contest Daytona by March of 1959. 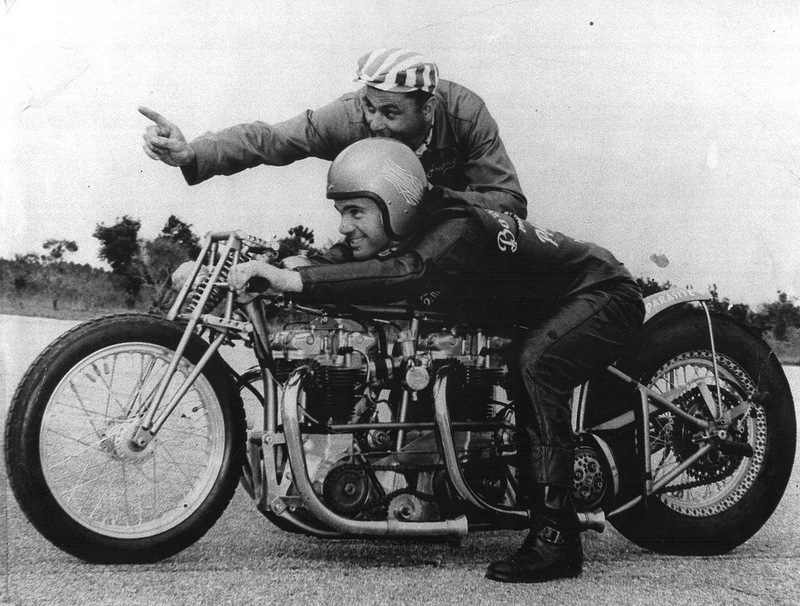 In the late 50s, the two-engine dragster concept was unheard of and John and Tommy spent hundreds of hours over a two month span designing, building, redesigning and rebuilding the motorcycle. Without the advantages of modern aftermarket and factory race parts, each part had to be fabricated by hand. The modified Triumph frame was hand built by John and included a girder fork front end brought back from England in a suitcase by Triumph Corporation’s Rod Coates. The half quart gas tank was made of two bicycle headlight shells and an empty can. The rear rim was reworked from an old Indian rim drilled out to save weight. Due to the horsepower created, most of the transmission gears were removed leaving only second and third. Finally, the drag slicks (not available at the time) were created from recapped Indian tires. But difficulties often follow the exhaust of innovation. 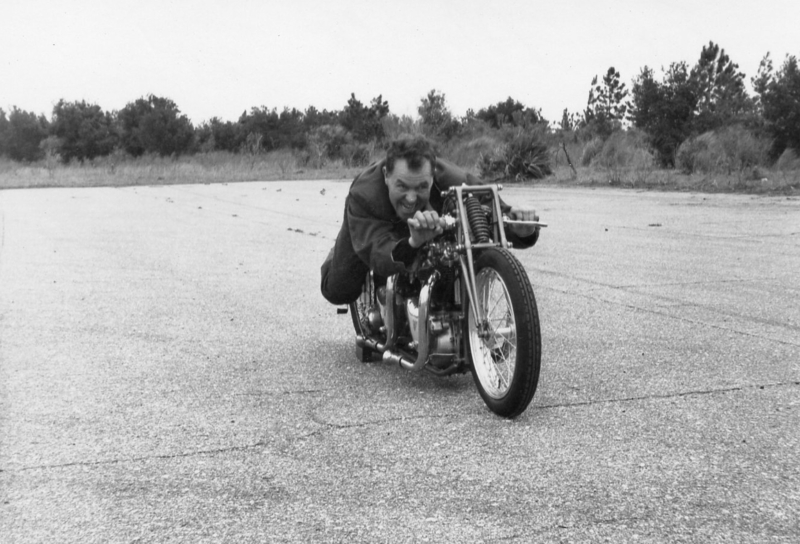 The bike was first tested, running only one engine, on Jericho Road, an old backwoods road know for drag racing. Timing both engines had become increasingly difficult. John worked tirelessly at it, breaking chain after chain. His first thought was to run the engines as a single four cylinder. What he got was a four-cylinder slingshot snapping chains straight up into the air. Then one day it came to him– the engines had to be timed as one. During the frame modifications, John ran into difficulty with the rear section braking and had to add gussets to strengthen it under the load of two engines. After working through all of these setbacks the bike was starting to come together. But before heading to Daytona they needed to race the bike in some local competitions. So they loaded the bike into Tommy’s station wagon and set sights on Indiana where they claimed their first victory. The $100 prize money, however, went even faster. For all proceeds went to the Pennsylvania State Police who stopped them for driving over 100 mph on their way to Indiana. One evening in the old, rickety shop of Bauer Cycles, John, Tommy and a group of racing friends were sitting around trying to come up with a name for the bike. Each took turns rifling through an old dictionary searching for a single word to describe the unique, twin-engine monstrosity. Finally, around the letter P, someone said they had found it. The room grew silent as he read it aloud: “Parasite, an organism living in, with, or on another organism.” That was it, one engine living off of the other. The Parasite had been born. Winter had faded into spring and Daytona was calling. In March John and Tommy made their annual pilgrimage down to Daytona Beach to compete in the Daytona Drags held at the municipal airport. But this time they had the Parasite with them. It did not disappoint. The Parasite won Daytona running a 10:42 ET at over 142 mph in the quarter mile, and making the front page of the local newspaper. The daydream of last winter had become a reality. My friend Matt Smith over at Smoke and Throttle has been schooling me on the legend that is John Melniczuk. All this incredible Triumph racing/building history and a showroom of beauties to die for, and in my own beautiful home state (no joke) of New Jersey of all places. Tommy eventually married and stopped racing the Parasite. John took over and ended his stint with a best ET of 10:33 at 150.23 mph. 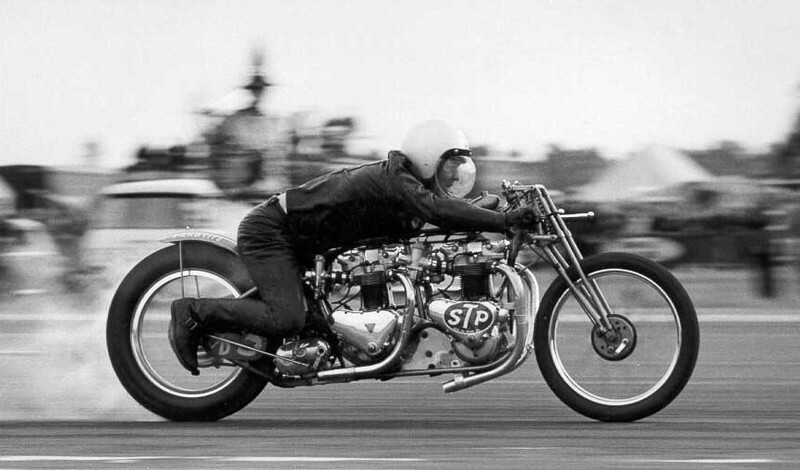 In 1964, John sold the bike to Don Hyland of New England who took the bike to England and ran it in several exhibitions races. Although John Melniczuk Jr. was only 13 when the Parasite was sold, he remembered every detail of the bike and its short but memorable history. In the 1985 John Jr. decided to find the Parasite. With only a name and a geographical location (New England), John Jr. set out on a ten-year journey to reunite with the estranged Parasite. He scoured Triumph shows across the country armed with a few photographs asking attendees if they had seen the bike. Finally one evening the phone rang, “I know where the bikes at,” the voice said. John had finally tracked down the Parasite, but its new owner didn’t want to sell. Many people had tried, but he had always refused to part ways with the Parasite– that was until John’s first-hand stories of the bike’s creation, racing heritage and victories compelled him to sell it and return the Parasite to its family. John Jr. contacted Guy, Tommy’s son, and the second generation of the Parasites’ family made plans to purchase the bike in New England and return it for a secret unveiling for their fathers. So, in December of 1990 under the guise of a Christmas party, the Parasite was unveiled to John, Tommy and all of their old racing friends. When the Parasite was uncovered, it brought a tear to Tommy’s eye. “That thing almost killed me,” he smiled. The Parasite had returned. Over the next several years John Jr. began the tedious process of gathering parts to return the bike to its original glory. By the turn of the century, the Parasite was restored and has been featured at the AMA Heritage museum’s “Race bikes of the Past” exhibit as well as several other motorcycle showcases. 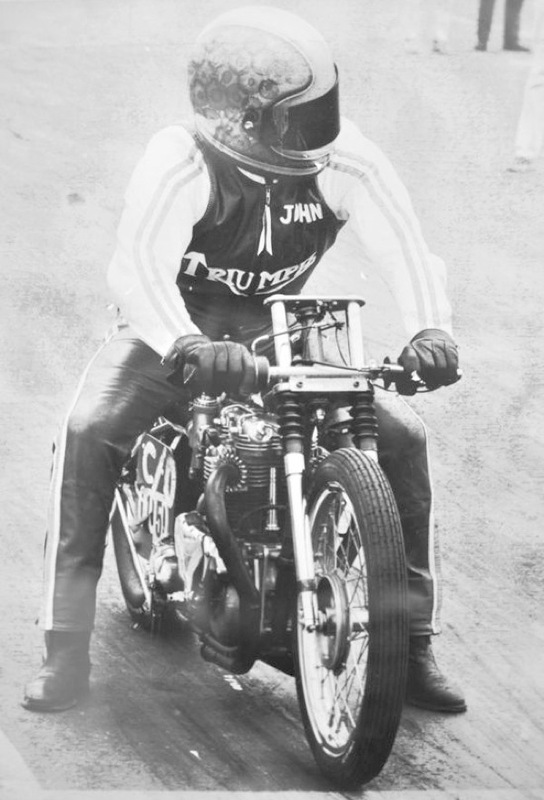 This entry was posted in Blog and tagged 1/4 mile, british bike, cafe racer, drag racing, sprint, the parasite, ton up, triumph, twin engine triumph, twin engne drag bike, vintage drag racing. Happy 4th of July from us to you!